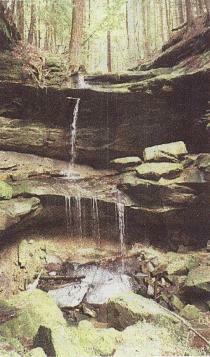 The 2005 OMLA fall foray was based in Jackson County and included trips to Lake Vesuvius in the Wayne National Forest (Lawrence County) and Canter’s Cave 4-H Camp (Jackson County). The first day of the foray included a variety of habitats in the Lake Vesuvius area, including moist and dry sandstone exposures and mixed hardwood forests. The group recorded 46 macrolichen species, including 17 new records for Lawrence County, and a new location for the state threatened species Dibeais absoluta. An additional 10 species of crustose lichens where encountered at this location. On the second day, Canter’s Cave was visited, which also had a wide array of habitats, including open grown trees in a large picnic area, mixed hardwood forest, various bare soil habitats, and moist to dry sandstone outcrops. This is also one of few locations in Ohio known to harbor bigleaf magnolia (Magnolia macrophylla). A total of 44 macrolichens and 12 crostose species were recorded from the site, including 9 Jackson County records, and one new record for the state threatened Canoparmelia texana. This two-day foray also yielded a list of bryophytes indicating a rich and diverse flora at these southern Ohio locations. A total of 64 mosses were collected, 37 of which were county records. In addition, 16 liverworts were also collected, and an amazing 14 of these were county records. Leucolejeunea clypeata was the “surprise” liverwort, as it is only known from 6 mostly southern Ohio counties. Some of the notable moss “finds” included Brothera leana, previously reported from 8 counties, and Fissidens ravenelii, known only from 4 Ohio counties. A full listing of all lichen and moss species encountered during this foray can be found in the January 2006 issue of the OBELISK. 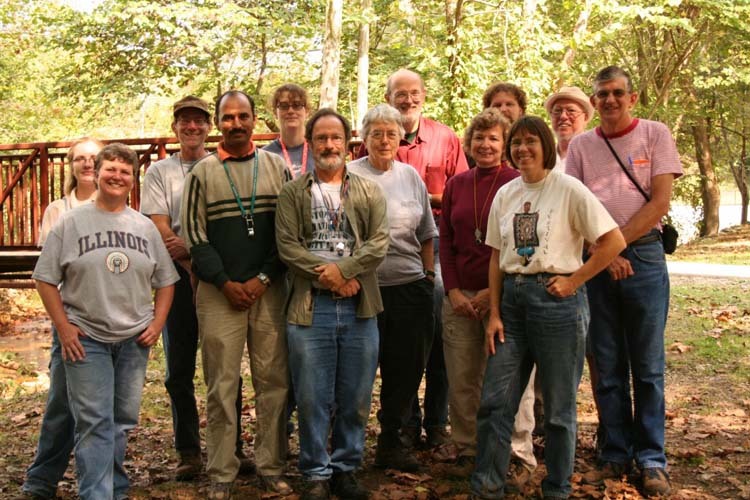 Participants of the Fall ’05 OMLA Foray, Lake Vesuvius, Lawrence County, Ohio (October 1, 2005).